This article explains how to use OneLogin as the authentication source for an app that can use Open ID Connect (OIDC) for federated authentication. 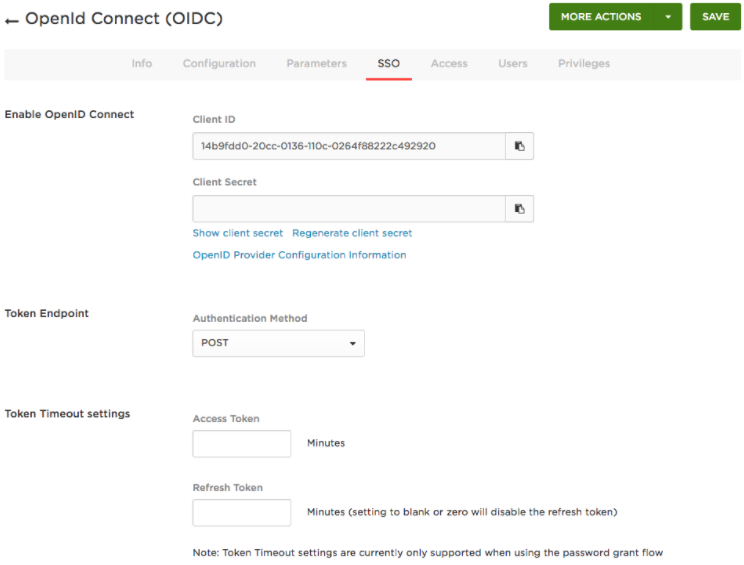 For a more complete overview of OIDC and for developer guidance, see developers.onelogin.com/openid-connect. OpenID Connect is a simple identity layer built on top of the OAuth 2.0 protocol, which allows clients to verify the identity of an end user based on the authentication performed by an authorization server or identity provider (IdP), as well as to obtain basic profile information about the end user in an interoperable and REST-like manner. OpenID Connect specifies a RESTful API, using JSON as a data format. OpenID Connect is an increasingly common authentication protocol; when an app prompts you to authenticate using your Facebook or Google+ credentials, the app is probably using OpenID Connect. OneLogin provides a custom connector option that makes it easy to configure your OpenID Connect-enabled app to use OneLogin as the authentication source in an OpenID Connect flow. A OneLogin account. If you need a free developer account, Create Account. Any OpenID-Connect-enabled app that uses the Implicit or Authentication (Basic) flow (The "Hybrid" flow is not yet supported by OneLogin, but it's coming soon). To build an OIDC enabled app, see Build an OIDC Enabled App. Access the OneLogin Administration portal and select Apps. Select Add App to add a new app. Search for “OpenId Connect” or “oidc”, select the OpenId Connect (OIDC) app. On the Configuration tab, enter the Redirect URI that your app uses as the callback endpoint. This is where OneLogin sends the authentication response and ID token. Login URL - In this optional URL field, enter the URL your users access to sign in to the app. Optional URL is required if users want to launch the app from the OneLogin portal. OpenID Connect enables service-provider-initiated (SP-initiated) SSO, but not identity-provider-initiated (IdP-initiated) SSO. When you provide a Login URL, OneLogin mimics an IdP-initiated SSO experience: the user is directed to the app’s login page, where the SP-initiated authorization flow begins. Redirect Uri - After the user authenticates, we only allow redirects back to items on the comma-separated list of URLs (or new-line). HTTPS is required. Http://localhost is only permitted for development purposes, it’s not for use in production. On the SSO tab, copy the Client ID & Client Secret values and use these in your OpenID-Connect-enabled app. Client ID - Public key, issued by OneLogin. It must be recorded by your app and passed with each request for an access token. Client Secret - Private key, used by the client to exchange an authorization code for a JWT token. Click Regenerate client secret to generate a client secret. For security purposes, don’t hard code this in apps. OpenID Provider Configuration Information - If your app supports self-discovery using provider metadata endpoints, this is where it locates details about OneLogin’s OpenID Connect implementation for this connector, including supported claims, grant types, and JSON Web Key (JWK) signing and encryption information. Token Endpoint - In the OpenId Connect Authorization flow, select POST or Basic, depending on the protocol your app employs to fetch an access token. For Dotnet or Node.js/Passport based apps, POST is most common. Token Timeout Settings - Only apply when using the Resource Owner Password Grant. For more information about OpenID Connect Implementation, please see OpenID Connect Implementation. To give your users access to your app in OneLogin, return to the app configuration page in OneLogin and go to the Access tab. Assign the OneLogin roles that should have access to the app and provide any app security policy that you want to apply.